Say what you will about Moosehead and their beers – and lord knows I’ve said some not-so-positive things about them in the past – but one thing you can’t say about them is that they don’t know how to throw a party. From their small afternoon media scrums to big evening blowouts, every Moosehead event I’ve attended has been a great time, even if I haven’t always been a fan of the beers being presented. This reputation continued with last Thursday’s launch party for Mr. Huff Persuasion Pilsner, the awkwardly named new release from Hop City, a small Moosehead subsidiary that operates out of the former Cool Brewing facility in Brampton. Held at 99 Sudbury, a swank events space in downtown Toronto, the bash also did double duty as an after-party for Moosehead’s annual sales meeting, which meant that the company big-wigs were on hand along with a few hundred other folks. In the main space, a DJ and cover band got the party mood going, while endless pints of all four Hop City beers kept attendees well lubricated. Where I spent most of the evening, though, was in the so-called “VIP lounge”, where media and other specially invited guests were led through a tasting of the four beers along with food pairings provided by Grindhouse. Not all of the pairings were knockouts, but the food itself was fantastic, with the house cured pork belly being especially outstanding. 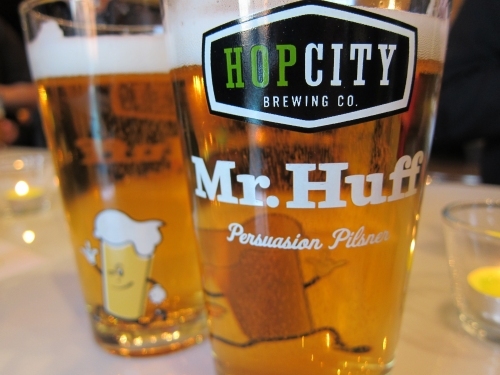 The main attraction, of course, was the night’s new beer, Mr. Huff. Festooned with a quirky name and a merchandise-ready mascot that reminded our table of Towelie (which in turn lead to lots of speculation about the true meaning of the name “Mr. Huff”), it’s obvious that Hop City/Moosehead has got the marketing down pat. But what about the beer itself? Well, it’s pretty damn good. With a clear and bight golden colour and a creamy white cap of foam, it looks great in the glass, and the fresh and zesty aroma of not-too-sweet malt and lemongrass hops is inviting. The mouthfeel is crisp and lively, and the flavour follows on the aroma, with some grassy/herbal and mild spice notes developing in the finish. Most at our table of beer geeks agreed that it could use a few more handfuls of hops to kick things up a bit, and at least one expert has suggested that it’s more of a Helles than a true Pilsner. But style aside, it’s simply a really well made lager that I could easily drink the hell out of. 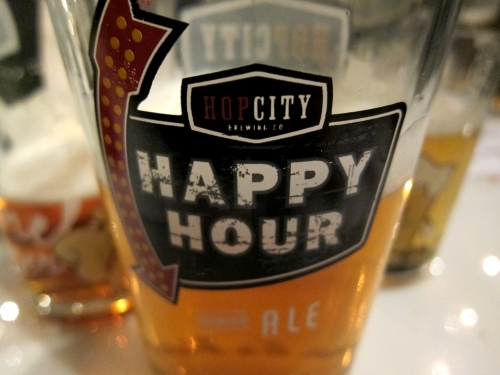 It’s worth a mention that the evening also served as a slightly belated coming out party for Hop City Happy Hour Ale, a brew that was quietly launched a few months ago. Brewed with Cascade and Kent Golding hops, it’s a balanced and sessionable pale ale with an aroma of caramel malt and slightly floral hops, and a flavour that builds on that aroma profile to also encompass a subtle earthiness up front and some sweet citrus to round out the finish. Like Mr. Huff, it’s not a showstopper, but I’d be more than happy to down a few pints. 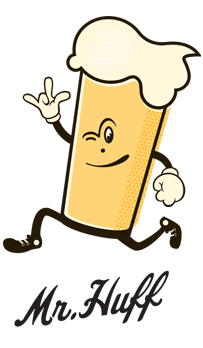 This entry was posted in beer events, beer reviews and tagged ale, Ontario, pilsner. Bookmark the permalink.